The sixth WFTO Principle of Fair Trade is about a commitment to non discrimination and gender equity. The Fair trade Fact Sheet this time looks at what a fair trade organisation should be doing to illustrate it's commitment to non-discrimination and gender equity. 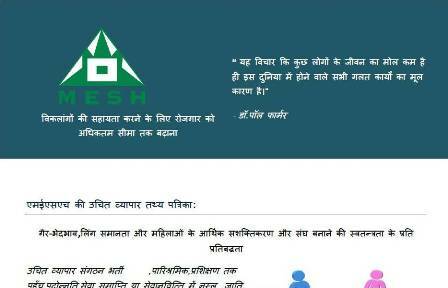 We produce these Fair Trade Fact sheets in MESH and translate them into Hindi for our artisans. Please feel free to use them to promote a greater understanding of fair trade but please acknowledge MESH as the source.